Part of an excellent crop of Nigerians currently plying their trade in the national team, Ogenyi Onazi is arguably one of the most accomplished of the youngsters for both his club and his country. A regular for both at the age of 21, the man born on Christmas Day of 1992 is getting the regular football on both fronts since the age of 19, and looks to have a maturity that few other have at his age. Possessing a wide range of abilities and by no means one-dimensional, Lazio fans and the people of Nigeria must be rubbing their hands together at the prospect of Onazi bossing their midfield for years to come. Born in Jos, it was when he moved to Lagos to join a team run by Christian minister and philanthropist TB Joshua, My People FC’s pro-youth policy meant that Onazi gained a massive amount of attentions from other clubs, with his performances at the under-17 World Cup in his home country earning him a trial at Serie A side Lazio. Coming runner up to Switzerland in the competition, Onazi and teammate and tournament top goal scorer Sani Emmanuel were two that got a golden ticket to Europe, as they both won contracts at the blue side of Rome. However, despite Emmanuel taking all the plaudits for all the times that he put the ball in the back of the net, Onazi has made the larger impact during his time in Italy. Making his debut in the 90th minute right at the end of the 2011-2012 season as a 90th minute substitute for Senad Lulic against Atalanta, first team action was a sign of things to come for Onazi, with boss Vladimir Petkovic giving him the chance regularly in the first team. Benefitting from the wisdom of Cristian Ledesma alongside him in defensive midfield as he made an impressive 28 appearances in all competitions, he honed his talents in both Serie A and the Europa League, as well as securing his first domestic silverware of his career as he started in Lazio’s Coppa Italia win over Roma. 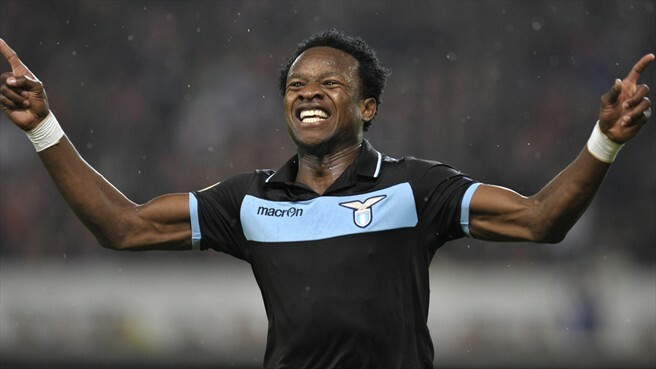 Continuing the trend into this season, Onazi has been a far more prominent figure in the Lazio squad this season, starting most games in the league as well as playing a large part in the club’s run into the last 32 of the the European competition, despite the various managerial issues that the club has been experiencing. The international scene too has the mark of Ogenyi Onazi on it as well, as his role in the Super Eagles team too has been an increasingly important one. Benefitting from manager Stephen Keshi’s promotion of the players who represented the youth team at various levels, he has been a constant figure ever since making his debut against Liberia during the qualifications stages for the African Cup of Nations 2013, as he formed an impressive partnership with John Obi Mikel in front of the back four. Keeping his starting spot during the tournament itself, Onazi picked up his first international trophy at the age of 20 years old, as Keshi’s side beat Burkina Faso in the final of the tournament in South Africa – with Onazi starting the final as the Super Eagles came out 1-0 winners. It may be Onazi’s mix of abilities that works best for him in his career, with his ability in both halves of the field differentiating himself from similar players in his position. Whilst the likes of Mikel have a fairly obvious and limited skill set, Onazi’s mix of tackling ability and positive offensive style makes him a perfect player to make into a world-class box-to-box midfielder. Scoring a belter of a goal from outside the area against Inter Milan this season, his lethal right foot could certainly prove useful for when his side are struggling to break down their opponents. However, the power, strength and willingness to throw himself into tackles makes him a real fan favourite, with a raw tenacity that could certainly be made into even more useful as he matures for his club and country.